PA announces cut in salaries to civil servants, following Israeli decision to withhold tax transfers to PA. The Palestinian Authority’s (PA) “finance minister” announced on Thursday that the PA would cut salaries to civil servants, days after Israel said it would withhold tens of millions of dollars in tax transfers to the PA, AFP reports. On Sunday, Israel's security cabinet approved the freezing of 507,697,000 shekels ($140,350,300) over the PA’s payments to prisoners jailed for attacks on Israelis. Israel, which collects taxes on behalf of the PA, says the payments encourage further violence. The PA claims they are a form of welfare to families who have lost their main breadwinner. The PA, which is already running a deficit, will "pay the salaries of civil servants in time, but they will be reduced", said “finance minister” Shukri Bishara after a meeting with EU representatives in Ramallah. The cuts will not apply to salaries "paid to pensioners and families of martyrs, wounded or prisoners", he added, adding that wages below 2,000 shekels ($550) would also not be affected. PA chairman Mahmoud Abbas reiterated on Wednesday he would not accept partial payment of the tax transfers owed by Israel. "We shall not accept the (tax) money if it is not paid in full," Abbas told a central committee of the Palestine Liberation Organization in Ramallah. The PA chairman made similar comments on Tuesday after meeting members of the leftist US organization J Street. 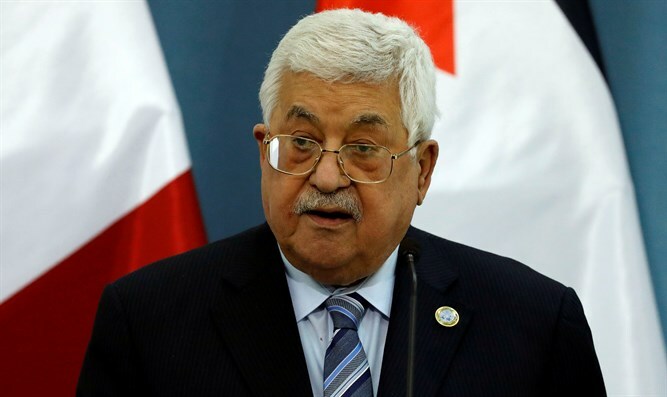 "Israel claims that the Palestinian Authority transfers funds to terrorists and therefore wants to offset these funds," Abbas said, according to Channel 13 News. "So I say that we do not want to receive these funds and every penny we have - we will transfer to the families of the martyrs." Meanwhile, the European Union on Thursday called on the PA to continue to accept tax funds from Israel.